President Donald Trump wants to take on Amazon. Amazon appears to be the frontrunner for a lucrative contract with the Pentagon to provide cloud services. It could be Trump’s first opportunity to take a shot at the retail giant. President Donald Trump appears to be gunning for a fight with Amazon – and he may have the chance to strike a serious blow in the very near future. Within the next few weeks, the Defence Department will submit to Congress its request for proposals on what could be a $US10 billion, 10-year contract to provide the military with cloud services, as the Pentagon is moving to migrate its data onto a cloud. Heather Babb, a Pentagon spokeswoman, told Business Insider that the competition would be “full and open” to land the high-profile and well-compensated government contract. Many insiders believe that Amazon, through its Amazon Web Services platform, has the inside track at winning the bid. Amazon did not respond to Business Insider’s request for comment on whether it planned to pursue the contract. But Amazon has nonetheless drawn some backlash from competitors and lawmakers who think it has an unfair advantage or that it is unwise for the Pentagon to select just one vendor. The internet giant holds the largest cloud-infrastructure market share, Bloomberg reported. Amazon’s status as the perceived frontrunner for the contract has been largely cemented by its $US600 million deal with the CIA in 2013, showing that it can manage and secure sensitive information and providing the company a leg up on obtaining top-level security credentials, the report said. Draft requirements released by the Pentagon for the project – called the Joint Enterprise Defence Infrastructure Cloud initiative, or JEDI – say that bidders must be able to obtain those security credentials within nine months of winning the contract. As of now, Amazon Web Services is the only potential vendor that meets that requirement. In addition, the Pentagon recently agreed to a deal worth up to $US65 million with a company that partners with Amazon Web Services to provide cloud services to the US Transportation Command. That deal was initially supposed to be worth up to $US1 billion, but the Pentagon slashed the total after facing criticism about how it awarded the contract, The Washington Post reported. 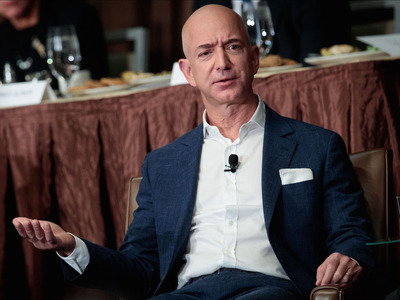 Critics said the Pentagon showed “favoritism” toward the Amazon Web Services partner, according to The Post, which is owned by Amazon CEO Jeff Bezos. JEDI came in the crosshairs of lawmakers in this month’s omnibus spending bill. Representatives on the House Appropriations Committee, which wrote the legislation, expressed concern about the contract going to a single company, something the Pentagon favours. The committee requested a report to both congressional armed-services committees within 60 days of the spending bill’s passage to explain why a single-award strategy was best. Lawmakers wanted to know the Pentagon’s exit strategy should such an arrangement backfire. The Pentagon had 45 days from the spending bill’s passage to provide the committees with their request for proposals for the JEDI program, along with spending requests for 2018 and 2019. This is where Trump comes in. The president has waged war against the internet giant for more than a year. On Wednesday, the news website Axios reported that Trump was “obsessed” with Amazon and eyeing legal means to target it, perhaps through a change in Amazon’s tax status or utilising antitrust legislation against the company. On Thursday, the manager of his reelection campaign hinted at potential escalation. Meanwhile, some opponents of the potential military agreement are clearly trying to plant a thought in the president’s mind. Trump also has something of a history of trying to influence his administration to move against a business entity he does not like. Before the Department of Justice sued to block AT&T’s proposed merger with Time Warner, The New York Times reported that the department had told the companies to sell off the part of the company that houses CNN as a precondition. Trump had spoken out against the merger extensively, targeting CNN as part of it. The Justice Department said Trump played no role in its decision. “The issue to watch with Amazon in the short run is a movement against the company receiving the sole award for cloud computing contracts for the Department of Defence,” said Dan Clifton, an analyst at Strategas. One person close to the White House noted that Trump – in his postings about Amazon and in Axios’ story from Wednesday – seemed interested in targeting the company through sales tax. The person pointed to legislation proposed by Republican and Democratic senators called the Marketplace Fairness Act, which would allow for sales tax to be collected from online retailers, though senators in states that have no sales tax have expressed opposition to the bill. The White House did not respond to a request for comment on whether Trump would try to persuade the Pentagon not to select Amazon for the contract. Regardless of whether Trump decides to go down this path to take a swing at Amazon – or focuses on antitrust enforcement or new legislation about sales tax collection – observers are expecting a fight.